I know – it’s impossible to say it without sounding like an up-yourself French snob…but who cares – it’s great. I am sitting in my local Le Pain Quotidien (translation: ‘The Daily Bread’) on Notting Hill Gate, marveling yet again at the delicious food, atmosphere and twinkly candlelit tables. I have been sitting here for a good hour, tinkering away on my laptop, using their (FREE) wifi on only one orange juice and nobody minds one bit. (Well if they do, they’re keeping it zipped). I love this place for many reasons, but mostly because I feel like I’m sitting in a good friend’s kitchen somewhere near fields, real live cows and mooing. I’m not, (central London has a distinct cow shortage) but the cosy communal tables, no-nonsense menu and beautiful cakes and pastries make up for this no end. 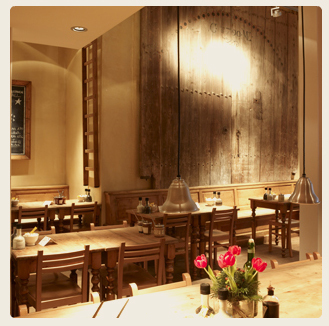 This cosy bustling chain was founded in Brussels by baker, Alain Coumont. He learned about bread when he was very small by watching his grandmother bake every Sunday. 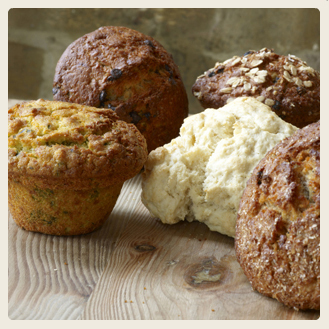 He is passionate about quality and creating rustic loaves honestly, beautifully and simply is what dings his bell. Ding. I am surrounded in here by students studying, business people businessing, a granny, a couple on a date (never going to happen) and a healthy sprinkling of happy randoms. I know it’s not a little independent unknown, but I still love this place. I have as much time as I need, free Wifi, power-points galore, a massive table to spread out all my bits and bobs, I feel calm, I feel looked after… and I feel hungry. Let me know when you’re coming and I’ll meet you for a coffee!